With the "all you can eat" holidays vastly approaching, there is an abundance of holiday recipes on the internet. To be honest, the southerner in my likes to stick to the old meat and three. I grew up on my grandma's "Meat N Three" cooking , so I can't help but seek them out in every city I visit, which has taught me that the entire concept is a more southern culinary tradition . Nowadays you're more likely to get a "three + no meat" type of situation. Which is cool, but I just have this deep affection for a heaping of fried chicken, a slice of ham, or to be more fitting with the season.. a juicy turkey wing smothered in gravy. And that meat has no business on your plate without the accompaniment of 3 sides, from mashed potatoes to collards swimming in potlikker and ham hocks. So to prepare for the up coming holiday seasons, the time when it's ok to eat everything and then feel sorry for it later. I thought I would post a few side dish recipes; a few that I’ve easily adapted from some of my favorite "meat and three" restaurants here in the south. From Mary Mac's Tea Room right here in Atlanta to my Grandma's place in Chapel Hill N.C.
Sweet potatoes are more widely known as “candied yams” here in the southern states. Yes, we are fully aware that they're not “yams” but the 2 terms are commonly used synonymously as one and the same. Busy Bee café is probably one of the best Soul Food restaurants in Atlanta. The “cook’s” special is normally what I order. Your choice of meat from meatloaf to chicken giblets, with a side of cornbread, a tall glass of sweet tea and of course 3 sides. 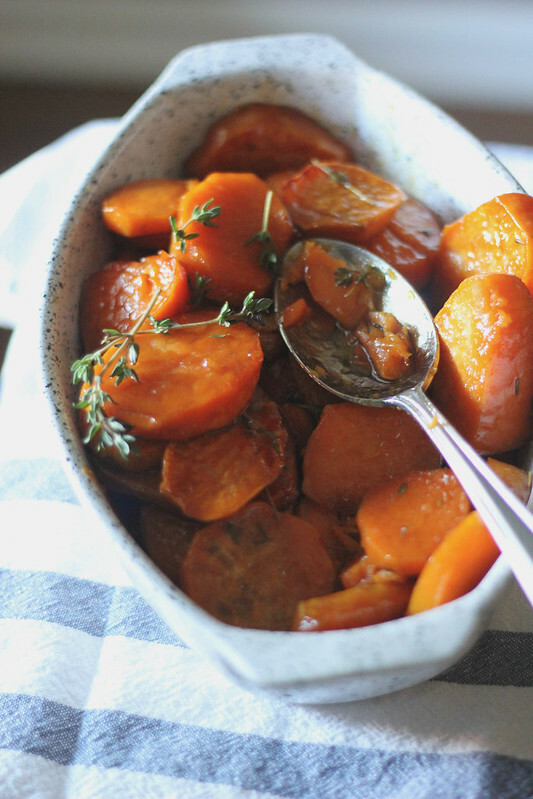 One side dish in particular is a little off white ceramic bowl, filled to the brim with buttery, sugary roasted sweet potatoes or better known as candied yams.. So here, I’ve made my version of their candied yams with a little cane syrup and brown sugar. Disclaimer- I don’t eat like that everyday. I would recommend that you don’t either. But like I said... the holidays call for over indulgence and I’m totally ok with that. 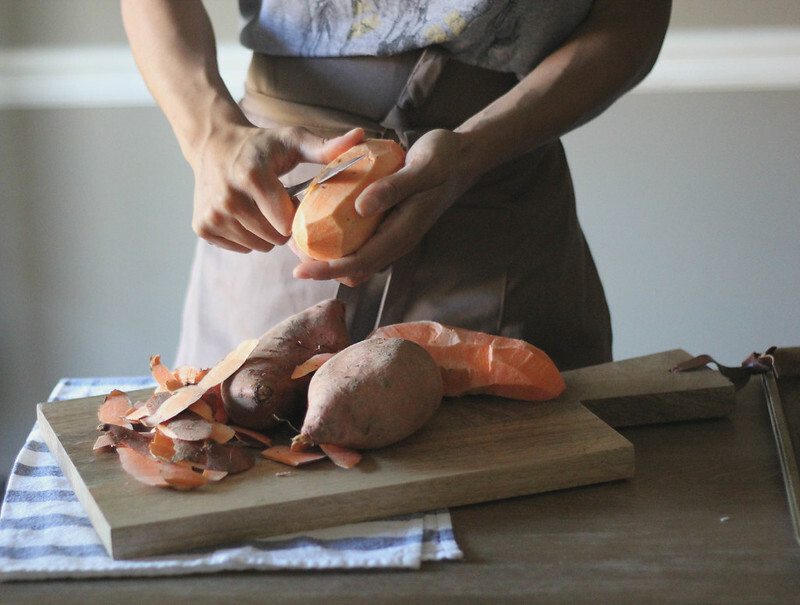 Preheat oven to 350 In large bowl, place sweet potato slices. 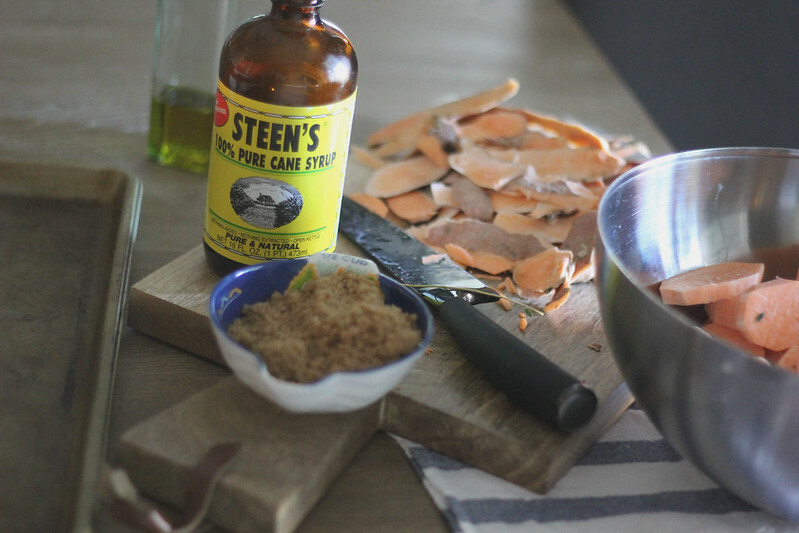 In a separate bowl, mix the olive oil, salt, butter, brown sugar and cane syrup together to combine. Pour cane syrup mixture over the sweet potatoes, tossing to coat. 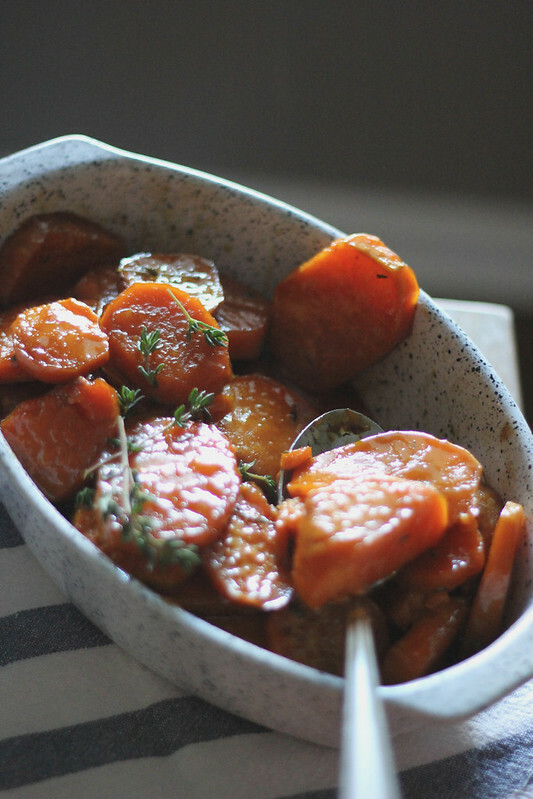 Arrange sweet potato slices in a single layer of a lightly greased baking pan. (There should be excess syrup mixture in the bowl). Bake at 350 for 30 minutes. Turn slices over and pour remaining syrup mixture on top. Bake for about 10-12 more minutes or until golden and tender. Transfer sweet potatoes to serving dish, then top with fresh thyme.